Life of an online marketer is not at all easy. The pressure to create measurable, effective and saleable campaigns and to get the desired outcome from it is no less that a battle. And the fiercest weapon in your arsenal is definitely your email marketing software. While the choices in this segment are many, you must go for the one that meets your need to design, deliver and measure your campaign most effectively. Which is the best software to go for? Well, it depends much on your requirements, mailing list size and other specification. But, here in this post we are reviewing today two of the most popular email marketing software; GetResponse Vs Pinpointe. Here we’ll evaluate and compare GetResponse Vs Pinpointe on their features, pricing and customer support in the most unbiased way possible. May the best software wins! · You can choose to create your emails and newsletters from scratch with HTML Coding or use the No Coding designing platform of GetResponse to create your Campaign. This flexibility makes it the easiest and ideal e-mail creator for both pro and novice marketers. · The Software offers over 500 templates and over 1000 HD quality pictures to you for no additional cost. · The simple drag and drop editing platform lets you customise your campaign with zero complications. · The emails and newsletters are created by GetResponse are 100% responsive and thus automatically adjust on your customers viewing platform; be it a laptop screen or i-pad or smart phone. 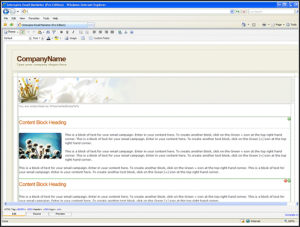 · You can create your customise e-mails and newsletters by using the WYSIWYG email editor. You can basically tweak the provided templates to customise them using this HTML editor. The software lets you design your own template too from the very scratch. Though the HTML editor is not very hard to use, and comes with a number of functions buttons, it may take a novice marketer sometime to get a hang of it. 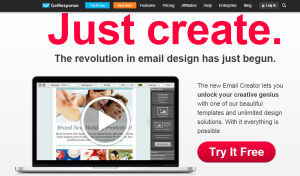 · The software provides over 100 HTML email templates that you’ll have to modify to create your own campaign. · You can add social media Share, Follow and Like buttons to your emails and newsletters. This gives you better Social media integration and makes your campaign more sharable. 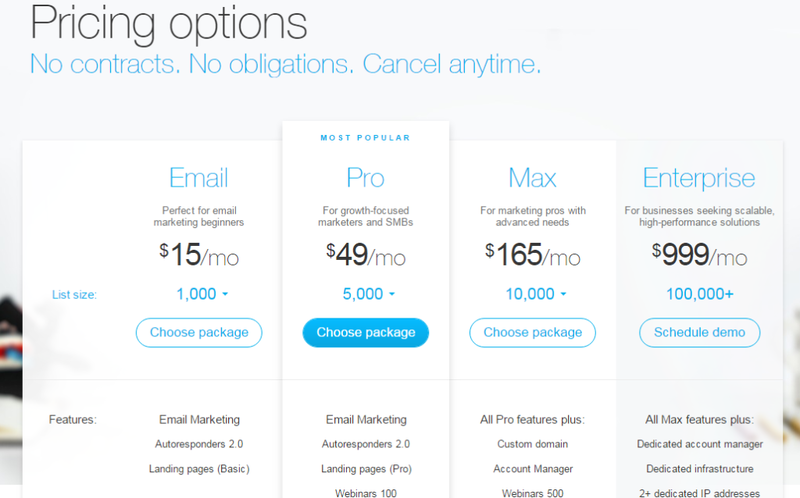 · While most email marketing software lets your save your previous campaigns, Pinpointe goes a little further. The software lets you send all your archived posts to your mailing list as RSS feed. 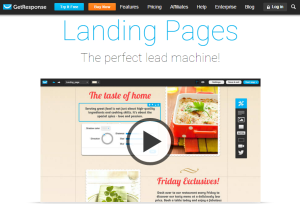 · GetResponse offers you one of the best Landing Page creators for no additional cost at all. Through this Landing Page creator you can design and create your Landing Page with pre-designed templates and pictures. Not only that you can also incorporate built in web forms and measure the response through A/B split testing methods. In short, GetResponse Landing Page creator will enable you to use all the features of any other Landing Page software with zero extra payment. · The software makes the task of managing and synchronising your contact list super smooth with its ‘List Booster’ feature. With this feature you can import your contacts to your mailing list from 16 separate sources including Yahoo, MSN, Gmail, AOl Mail and much more. You can also import contacts direct from your disk and client mails. · Pinpointe offers no Landing Page creator, but lets you integrate some of the best Landing Page Software. · The software offers really great list management services to its clients. You can import email contacts, update your list setting for you. 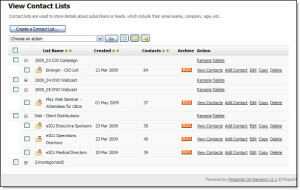 The best of all the software does the contact list de-duping for you, so your subscribers will not end up getting multiple mails on the same subject. · GetResponse Intutative Email Intelligence that lets you keep track of your campaign and measure your ROI. · The features lets you view consolidated reports on basis of time metrics (when your buyer is taking actions towards your newsletters), email comparisons (so that you find out which one is getting better response among any two campaigns), social media sharing statistics, and finally the weekly consolidated report for your campaign. · The software offers complete Google Analytics integration. · The detailed report on bounced and spam mails lets you manage and update the contact list regularly. · Gives you the link click reports, so you can calculate the ROI. · Pinpointe offers one unique feature named ‘Digital footprint’ that gives you total manual event logging and Google calendar integration. · The software provides 24*7 live chat support to their customers. · Customers can also avail email support and telephonic support (Mon-Fri, 9 AM-5 PM EST) from GetResponse. · The software share an extensive pool of resources in terms of Marketing Tutorials, Blogs, Guides and Webinars. · Offers 24*7 live chat and e-mail support. The Pricing starts from $15 only, which we think quite reasonable for the services GetResponse provides. But before you subscribe to any of these plans you try their 30 days trail pack. The GetResponse 30 days trail package is completely free of cost and lets you access all its features. So, you get a experience of what you are paying for in a completely liability free way. 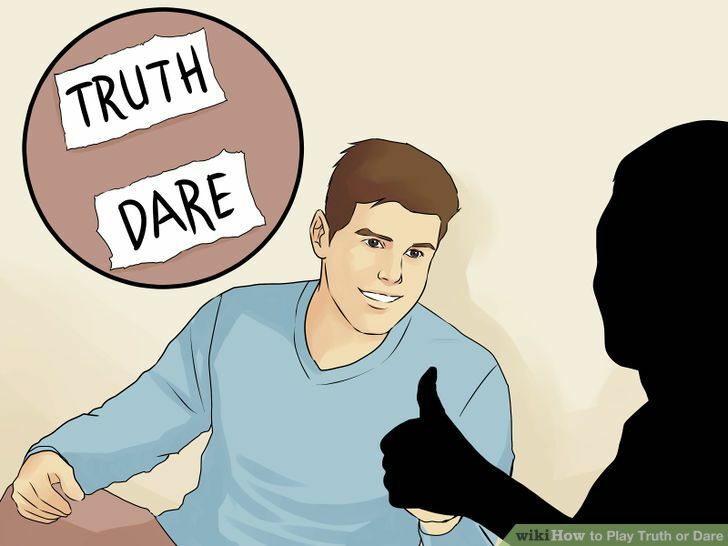 You can download the 30 days free trail here. 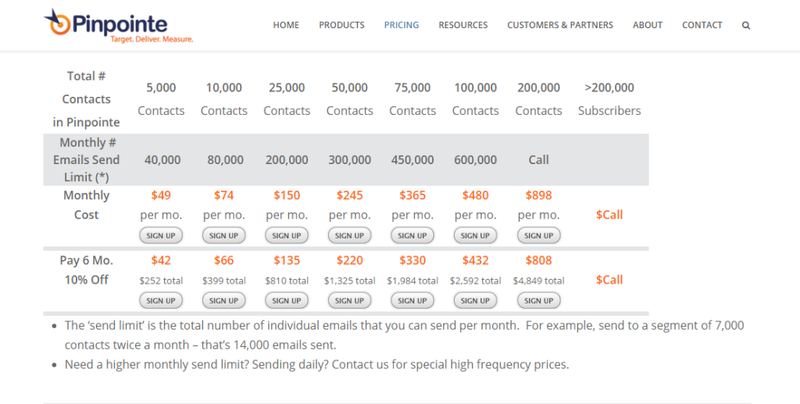 The pricing starts from $49 per month, which is off course a little on the higher side for small businesses and freelancers. The software also offers a free trail for its customers to try out. But the duration of the trail is 15 days in this case. You can get the 15 days free trail for Pinpointe here. Well, after reading this long, we think you can yourself understand the strengths of both the software. Easy to use. No matter whether you are a novice or pro you’ll find GetResponse equally easy to use. Offers you a great Landing Page Creator, thus saves you money on any Landing Page software that you would have to purchase otherwise. Gives you extensive tracking and analysis reports. Offers flexible and reasonable pricing options and longer free trial period. Let’s you create unique newsletters and emails through HTML editing. Offers extensive list management facilities, which is essential in case you have a huge mailing list. The RSS Archive mailing feature lets your customers see all your messages in one place. Well, if you have an extensive IT support and a huge mailing list, then Pinpointe can be a good option for you. It is more suitable for B2B communications in our opinion. On the other hand, GetResponse is superbly perfect for every category of online marketers. The interface is easy to use and at the same time allows you to do the HTML coding provided you have the resources, the Landing Page is quite superior than any other available in market and the pricing is amazingly flexible. So, as for us GetResponse is a sure winner. Which email marketing software would you go for? Let us know in the comment section.